Shedding Winter, and Standing Proud Wild | On The Trail of ALASKA! After a particularly brutal winter in Turnagain Arm she stands tall and proud wild. and will have to grow a new one when freezup comes again in three to four months. but a posture of an absolute commitment to a dignified survival in a wild and harsh environment. 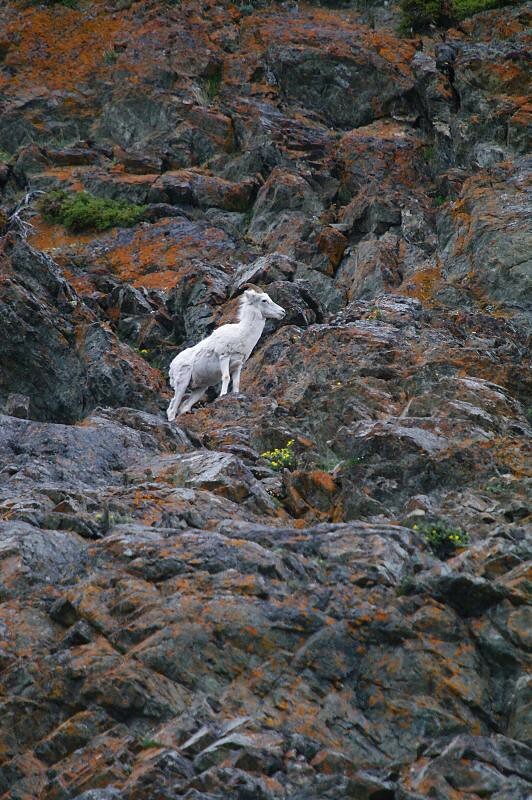 Ewe Dall Sheep, Turnagain Arm, Chugach Mountains Alaska. The colours of the image underline the posture of absolute consciousness in communication with your presence. Beautiful Steve… love the animal. wow… just wow… you need a talent not just to take a great picture but to see this great picture first and then catch a moment. you have it all! Thanks Steve. All is well here thanks to very small aftershocks.